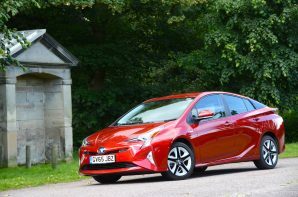 It’s the 4th generation of Prius and yet again there have been impressive improvements in fuel economy, but what about driving panache? Well Toyota claim that this is the most sporty Prius ever with a lower centre of gravity, lower roof line, and the adoption of double wishbone rear suspension no less. But is the eco Toyota really a reformed character? We won’t spin this out. This is the best Prius to drive, but no it is not entertaining. What it is though is competent and that perhaps is the best we could hope for. Negative bit over, the rest of the news is very positive. Toyota has refined the drive train still further which allows the carried over 1.8 litre petrol to achieve 40% thermal efficiency. This is a new record (the 3rd gen car was the previous record holder). The motors are smaller, but deliver similar performance, and the 1.31 kWh battery remains Nickel Metal Hydride but occupies 10% less space so that it fits fully under the rear seat liberating more boot space and facilitating the fancy rear suspension. In addition to being more efficient it is also more refined. Previous versions created annoying amounts of din with little gain in forward momentum which was a strange sensation. To remedy this the system now makes greater use of the torquey electric motor which reduces the petrol engine’s workload. The result is less noise and even greater fuel savings. A win-win. So the Prius is now quieter, amazingly efficient (and that is in the real world too), more practical thanks to a 501 litre boot, and whilst the new suspension hasn’t turned it into a driver’s car it does facilitate a much improved ride. The only real negative points are the lack of ultimate involvement, the asking price and the elephant in the room…. it may achieve a stunning drag coefficient of 0.24 but the looks are an acquired taste.